Spend it on transit instead of new Interstate 95 ramps. Access has been a key concern for the new mixed-use development planned by Under Armour CEO Kevin Plank on an isolated point of land jutting into the Middle Branch of the Patapsco River. And the ramps have been a key component of the proposed solution. When last year’s Port Covington grant application for new Interstate 95 ramps was rejected by the feds, it pushed the ramps back to square one. But even if the ramps had somehow miraculously been approved, they would still be back at square one this year. That’s because the Port Covington team realized its original plan would not have solved the access problems anyway, and that an additional ramp had to be added to the plan. But an expensive new ramp from southbound I-95 onto McComas Street west of Key Highway won’t solve the access problems either. The only way to create a significant overall access improvement for Port Covington is to build the proposed light rail spur and make it an integral part of a larger regional rail system, for which the city’s TIF fund is an appropriate funding source. In a best case scenario, the new ramps would only help one bottleneck and get them to square two. But it won’t happen soon because this year’s new application is even less likely to get the federal money. But what is now clear is that $23 million of Port Covington’s $660 Million Tax Increment Financing (TIF) fund is being reallocated from other projects to help pay for the extra ramp. In other words, Pandora’s TIF box has been opened. This creates a precedent for other re-allocations. If the I-95 ramps are fair game, attention should be paid to transit TIF funding as well. Port Covington’s isolation is the basic challenge. What makes access so difficult is what made the site so attractive for the Under Armour corporate campus in the first place. The site sits on a peninsula with limited access to the rest of the city, enabling it to create its own identity. But while overall access is limited, the existing access from Interstate-95 is excellent. It consists of six ramps. These ramps are certainly not attractive, connecting to the site via a Jersey-style jug-handle on Hanover Street, a U-turn loop on McComas Street and a parallel at-grade railroad track, but these can and would be corrected regardless of any new ramps. 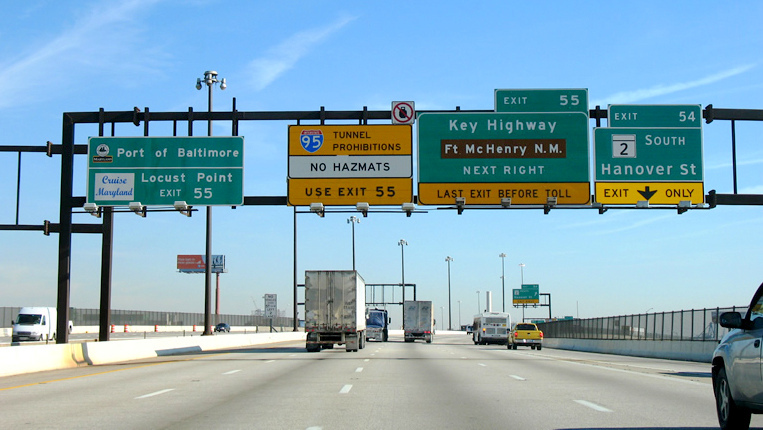 What can’t be corrected are the inherent physical limitations of Interstate-95 — the Fort McHenry Tunnel under the harbor just to the east and the Interstate-395 interchange just to the west. These limitations put a “hard cap” on available traffic capacity that can’t be increased. Moreover, Interstate-95 must serve as the “main street” for the entire northeast corridor from Washington to New York that creates a huge reservoir of traffic demand that Port Covington must compete with for its share of the overall capacity. At the same time highway access to Port Covington is excellent but limited, transit access is poor but highly expandable. The light-rail transit spur to Port Covington offers comprehensive connections to Amtrak and both MARC rail lines, BWI-Marshall Airport, downtown and the entire regional rail system. While Kevin Plank’s development company has embraced the idea in concept, it has revealed no real information for what it might look like. Numerous critics, including the American Civil Liberties Union of Maryland and Bikemore, pointed out the lack of commitment to transit in the developer’s TIF application to the city. The TIF was approved without the changes they sought but since funds appear to be subject to re-allocation, why not revisit the issue? Doing so is critical because Port Covington must be designed around the transit line in order for it to function properly. Baltimore has learned the hard way that “Transit Oriented Development” will fail when the timing and coordination are not close to perfect – see Westport or the dead zone at Howard and Lexington streets for examples. Among the basic contentions of critics of the Port Covington TIF package is that the city would be spending an inordinate share on amenities and other fluff, rather than on basic infrastructure and development to stimulate economic conditions for the entire city. Spending TIF funds on transit would be a very clear way to dispel this accusation. The new light-rail line would link directly to the west side of downtown, which urgently needs the spin-off benefits promised by the Port Covington development. It could then tie into a modified Red Line via a Lexington Market Transit Hub to link to the West Baltimore. It could also be tied into the Hanover Bridge reconstruction project to serve large potential redevelopment areas in working-class Cherry Hill and Brooklyn to the south. Spending city TIF tax money on an archaeological pier, aqua-thermal lake and other assorted frills has always appeared to be discretionary. The new I-95 ramps fall into the same category, for the Baltimore residents underwriting this latest mixed-use waterfront development. Port Covington needs to be developed in a way that reflects priorities and fiscal discipline, which means basic infrastructure must come first. The light-rail spur needs to be built as a top-priority central element of the Port Covington project to assure that the project helps and links to the entire city. Gerald Neily is a former transportation planner for the Baltimore Department of Planning. With a limited view of what Baltimore could be, city leaders fail to lure the pioneering online retailer.